DJ TeeTee is a London-based DJ whose musical journey began at New York City&apos;s legendary Scratch DJ Academy. Originally armed with a self proclaimed love for heavy bass hip-hop, TeeTee&apos;s musical style is one that now encompasses her wide musical palette. Fusing hip-hop and house, to electronic remixes and anything else in between, TeeTee transports audiences through a seamless transition of genres. With a following that grows steadily day by day TeeTee has collaborated with some of fashion&apos;s most coveted brands including Atlanta&apos;s flagship Topshop store and leading British brands such as Skinnydip and Boohoo to name a few. Lending her talents to both the international nightlife and radio scene TeeTee has been featured on line-ups in Germany, Leeds and London having headlined Rock Steady at Frankfurt&apos;s Gibson nightclub as well as Berlin&apos;s Hip Hop Don&apos;t Stop radio show. 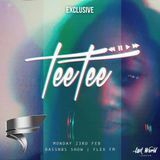 TeeTee&apos;s aim is simple: to create an energetic vibe that reflects her wide spanning musical influences.